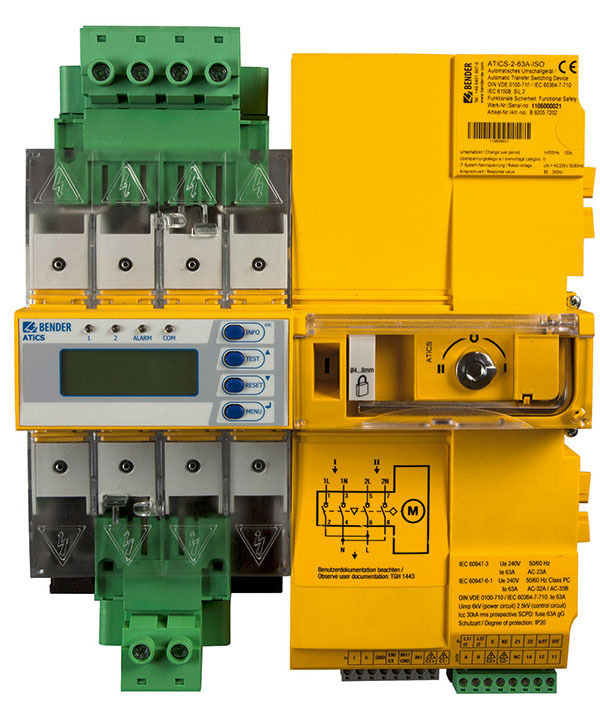 ATICS®-…-ISO switching devices provide all functions for changeover between two independent power supplies and for monitoring unearthed power supplies. The power section and the electronic section integrated in one flat, compact enclosure allow space-saving installation into the respective distribution board, simplifies wiring and reduces error potential. ATICS® has been developed consistently according to the Functional Safety standards (SIL 2) guarantee highest reliability. Connectors at all connecting wires – in combination with the optional bypass switch – allow ATICS® to be tested or replaced during service works without interruption of the power supply. ATICS® considerably enhances the safety level particularly in intensive care units and operating theatres. Power supplies for sensitive equipment used in Group 2 medical locations, for example, must function safely and reliably even under fault conditions. A major contribution to achieve this are two redundant supplies and the design of an unearthed power supply system (IT system).